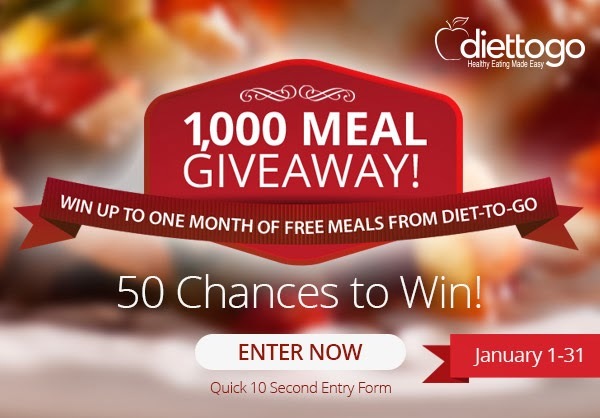 MamaBreak: #Diettogo 1,000 Meal Giveaway Sweepstakes! What a fantastic way to kick off the new year! TONS of prizes and an easy entry form! #Diettogo is giving a way a ton of free meals, and what a perfect way to start off the holidays. If one of your resolutions is to lose weight, then this is a simple program for you. They send you all the meals you need, and let me tell you they are DELICIOUS! We have reviewed them a couple of times, and I think my favorite is their Stuffed French Toast! They have several different meal plans to fit into your needs and tastes. You can even tell them about any food allergies (or dislikes) you may have and they will create a special plan just for you! The meals include breakfast, lunch, and dinner, and you can choose to subscribe to as many weeks as you would like! The food all arrives in a cooler ready to go into your own freezer! Then, each day, you can pick your own meals or follow one of their carefully constructed meal plans. These are so fantastic to bring to work when I am running behind and cannot take the time to make a lunch in the morning! So much better than snacking! And the meals are delicious and nutritious! Want a chance to win even MORE prizes? Diet To Go is also hosting a Twitter Party on Tuesday, January 7th. A great chance to ask all of your dieting questions and get answers straight from a professional! AND there will be prizes as well! They will also be providing a special discount code for Twitter only at the end of the party - $50 off your first order! A great chance to win great prizes and take off the pounds for the new year! Help me reach my resolution!